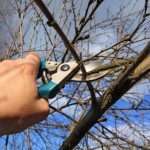 Our expert tree surgeons can plant trees of all sizes and specifications for properties in London and Surrey. GraftinGardeners are experts at planting trees and shrubs. Our team has planted many trees for customers and businesses in and around the London area. We can help you make the right choices when deciding which tree to plant, from sourcing the best specimens, planting the tree to your specifications and also advice on tree aftercare and maintenance. With a dedicated team of tree surgeons, grounds men and gardeners, we can plant any size tree up to 6 meters. We have the experience to get your tree into your garden safely and the man power to situate your trees to your specific requirements. The first step is deciding where to position the plant; this is known as marking or setting out. Once an appropriate site is located we can then excavate the planting pit or pits. We will then place the tree into its hole and fill it with a suitable composition. After the tree pit has been backfilled, we’ll use stakes and anchoring to firmly secure the tree. Once the above is complete, we’ll remove any excess soil and give the tree some water to ensure its health. If you need advice on tree aftercare and maintenance we’ll be happy to help, contact us on 0208 123 7653 for more information.